As a small business startup we spend a great deal of time looking at our data and analyzing that data to help us drive strategy, make adjustments, and better understand our customers. We try hard to not be robotic in our response to numbers, but rather to let them inform our decisions and our direction and we believe that this is how all small businesses should use their own data. Here is the first in what will be a serial discussion of some of the data we look at internally, the numbers we analyze, and our strategic approach with this data. Since we launched last May, we have heard from our Creatives that they wish that Buyers would be more generous with their feedback and comments. We took this issue seriously and started to look for ways to encourage buyers to score all entries and to leave comments for creatives. Our goal was to increase the average number of comments left by Buyers in every project and the strategy we chose was education. We found several points of “touch” where we were able to push information to Buyers and beginning July 24th of last year (week 30) we put some new improvements in place. First, we added a “success” page to which the Buyer is taken upon posting their project. This page is the 4th tab on the project page and remains visible to the Buyer as long as the project is open. Second, we developed specific content on how to leave high quality feedback and included it in the first notification a buyer recieves when they post their project. The impact was almost immediate. 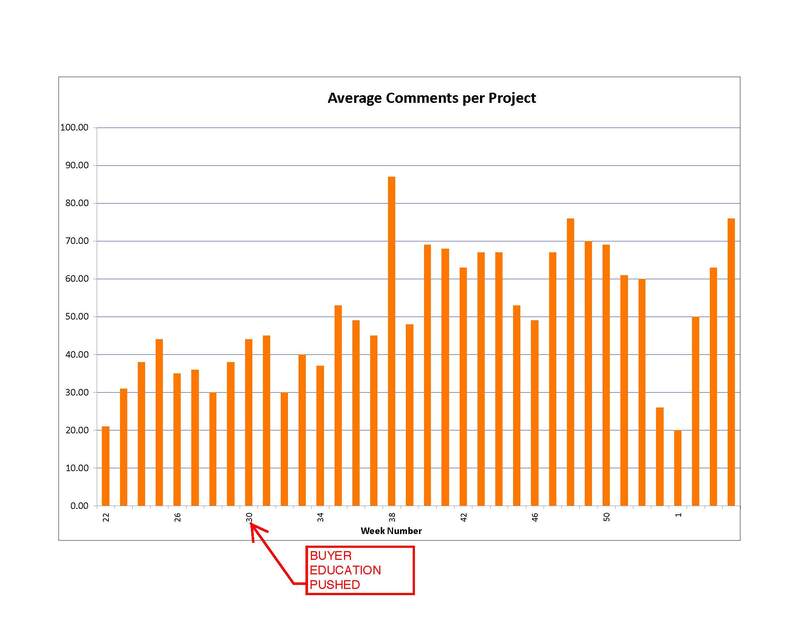 For the 8 weeks prior to the changes, Buyers were averaging 34.1 comments per project. 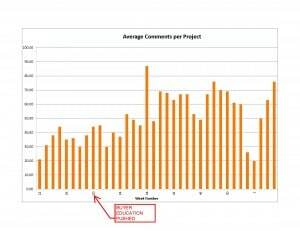 Two weeks after we began providing this education, the number went to 45 comments per project, and by the end of August the number was 53 comments per project. We have continued to see the number trend upwards week over week (aside from a holiday dip) and project that the trend will continue. The chart shows weekly averages – note how the average for the first 10 weeks or so remained fairly flat. But roughly 2 weeks after the changes were made (just as the first wave of “educated” projects was coming to completion) the trend started to slope upwards. We believe that this is a nice illustration of how education can move the needle in a community such as ours.